Surfers and skaters, bicyclists and ballplayers, golfers and gliders, runners and rock climbers, scuba divers and skiers — there are probably more types of outdoor sports enthusiasts in San Diego than anywhere else. Of course, what this really means is that our homes, garages and patios are prospective breeding grounds for bikes, balls, racquets, golf clubs, surfboards, rollerblades, helmets, gloves, fishing poles, fins, skis and innumerable other sports accoutrements. Collecting sporting gear seemingly has become as much of a hobby as the recreational activities themselves. there are dozens of sports, and each has its own type of equipment and accessories. Some are used year-round, while others are pressed into service only seasonally (aka “once in a blue moon”). Without an organized system for storing all your paraphernalia, you can end up spending more time playing hide-and-seek with misplaced gear than you do playing your preferred sport. Luckily there are some excellent space-saving organizers available to help you stay on top of your game — or games, as the case may be. One of the basic rules of organizing is, “Group like things together.” But rules are made to be broken (at least in the organization game). Although multipurpose racks will work for various items, certain types of sports equipment require specialized systems. The best storage solutions for the gear groups listed above are easy to access and space-efficient while also providing room for sport-specific accessories. • The Double-Vehicle Bike Rack (www.homestorageusa.com; $58), a wall-mounted rack which holds two bicycles vertically and has shelves for helmets and shoes. • Cabela’s Solid Oak 10-Rod Four-Drawer Rod Rack (www.cabelas.com; $120), an attractive stand-alone unit designed to neatly store almost every category of fishing gear from rods to reels, reel oil, extra parts and tools. • The wide range of golf gear storage systems from Great Golf Memories (www.greatgolfmemories.com), including the Golf Organizer with Bench ($118), which has enough storage room for two sets of golf bags, golf shoes, gloves, caps, and other accessories. • A rolling rack called the Scubamate (www.scubamate.com; $213), efficiently designed to let you hang, hose off, dry and store all your scuba gear together in one place. 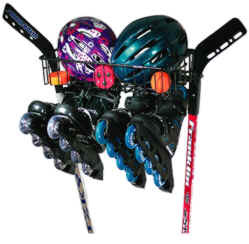 • The Garage Squad’s wide range of wall-mounted racks, including the Skate Storage Rack (www.garagesquad.com; $27) which features storage for two pairs of in-line or ice skates, pads, helmets, and hockey sticks. • The Dekrak (www.sportstorage.com; $10), a versatile wall rack that can hold skateboards, helmets, snow skis, water skis or snowboards. Sportstorage.com also carries a good selection of racks for storing additional ski accessories and other sports gear. • The Sports Equipment Center (www.spacesavers.com; $100), a free-standing system designed to accommodate team sports gear, including every size ball, up to three baseball bats and four pairs of shoes, with six hanging hooks for caps, helmets and gloves. • Mac Racks (www.wetsand.com; $53-$87), an assortment of wooden wall racks for storing a surfeit of surfboards, as well as snowboards, sailboards, wake boards and paddleboards; the racks come in single, double or triple levels sized for storage of almost every type, length and shape of sport board up to 6 inches thick. 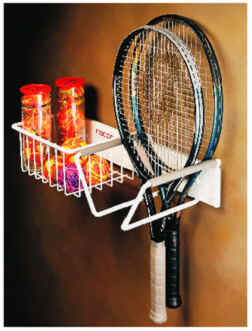 • The Racor Racquet Rack (www.garagedepot.com; $37), a wall-mounted organizer with molded rubber sleeves to protect up to eight racquets from scratches and a roomy basket for holding ball cans and accessories. Note: If you want your sports equipment to be ready whenever you are, always make sure items are clean, dry and in storage-worthy condition before putting them away. Webmaster's message regarding e-mail: The e-mail address on this site is displayed as an image link to protect the address itself from internet fraud. Clicking on the e-mail link will open a temporary e-mail address, valid for current use only. If you would like to keep a permanent e-mail address for this site, please manually key in the above address.